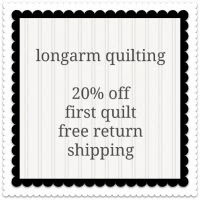 Quilt Taffy: Giveaway Day! Squirrels, Fireflies or Sophisticated, you choose! Giveaway Day! Squirrels, Fireflies or Sophisticated, you choose! 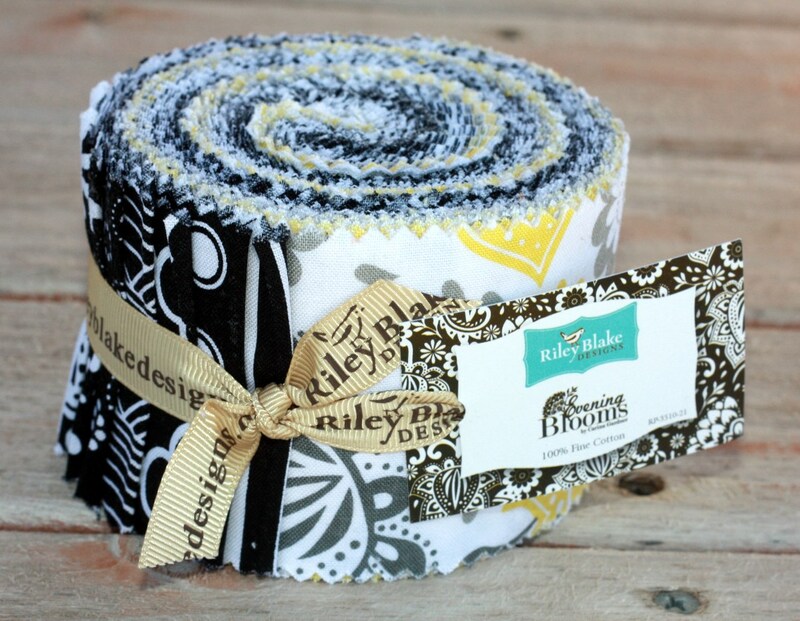 Riley Blake - new releases! Looking for Black and White? It's here. Great collection of prints. Darling fireflies in a jar. We just got more Bluebird Park. a charm of your choice. leave a comment about camping. 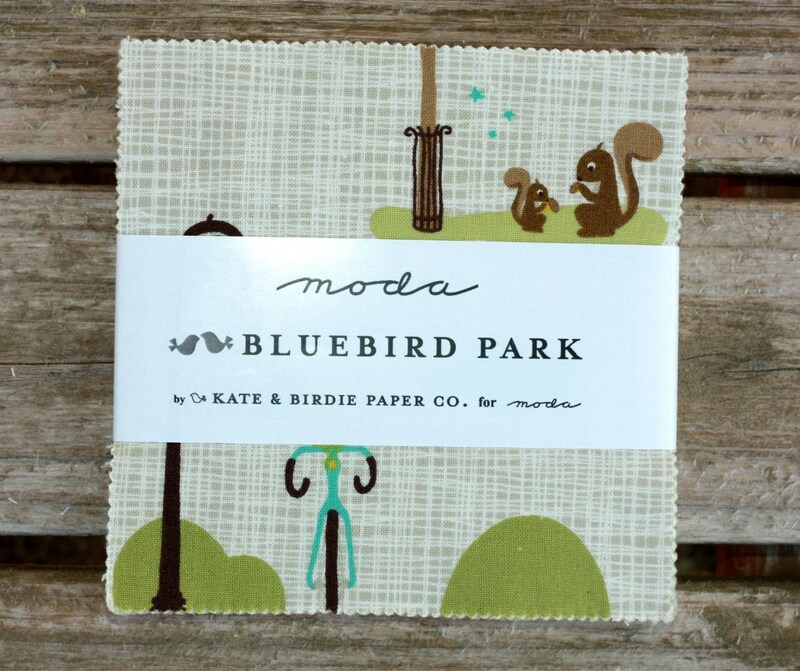 Ther Bluebird Park collection is very nice! Thank you, very much!!! 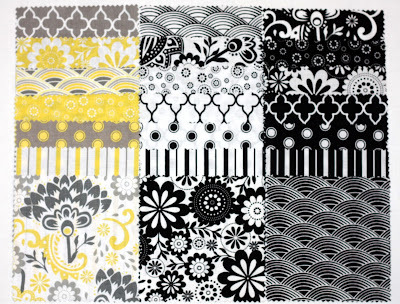 love all the new designs, especially the black and white and yellow. I love the Camp-a-lot one! As a kid we used to go camping for the whole summer! Us kids would be loaded into the car straight after school and driven to a tent the Vinkeveense Plassen. Basically a grassy island in a lake, with a tent on it and a boat (no motor).... Over the years we did get a motor, and a small sailing boat and a canoe and surf boards and little tents of our own..... Six weeks later, nicely browned, feet black from the turf ground seeping in (wouldn't get that of until winter) and completely wild at heart we would return home to start school again. In spite of the musquitos, the rain (this is The Netherlands), the storms and the occasional accident...... it was absolute bliss. I love camping! As long as its in my RV :) I really love camping in the woods with the comforts of home. I love the out doors, always have, but never really enjoyed sleeping on the ground in a tent! Yay for RVs! I'm hoping the weather holds as we're off camping next week!! Ohh the blue bird park is fun ..
Definitely bluebird park for me - I just love all those cute little animals. Camping - I can't stand all the preparation work that goes into it, but once I am there I am happy if it doesn't rain!! I love camping! We started out going camping in a tent, then upgraded to a teardrop camper. Now that we have an infant, we're looking for a something that can sleep three! 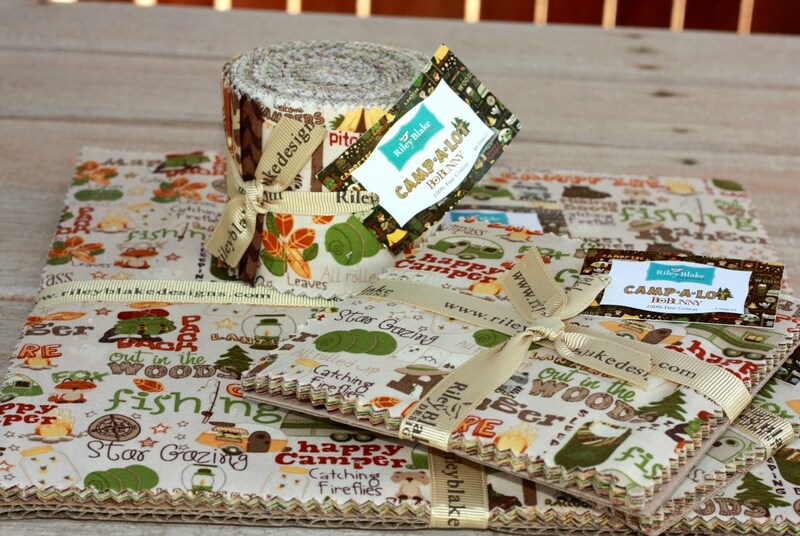 If I win, I love the Camp-A-Lot fabric! Thanks for the chance! I used to love to camp. I don't think I could sleep on the ground like that anymore though, so maybe a camper would help. I feel so old just saying that. Hello! I love camping! My kids love it too! My favorite anecdote is camping at Grand Canyon Park, opening the tent door and seeing a coyote pass by! That camping fabric is adorable. I have not cameo in over 20 years. We stayed in a pop up tent. Not too bad. Love the fabrics. I went to Girl Scout camp when we lived in Alaska many many years ago. It rained most of the week, and on one of the non-rainy days, we hiked down to the shore to have a picnic & there was a dead moose on the sands. Still had fun though. Thanks for the giveaway. Hubby hates camping, but I love to go with the church girls. We love camping. Both our children went camping for the first time before they were a year old. We go away at least every two months and it is a great lifestyle. They love it and it is so relaxing for me. Lots of stitching and knitting gets done while we camp!! PS I love Bluebird Park and Camp-A-Lot. Brilliant fabrics!! Hate camping, but the fabric is cute. When I was younger, I enjoyed camping. Now I would rather stay at a hotel. 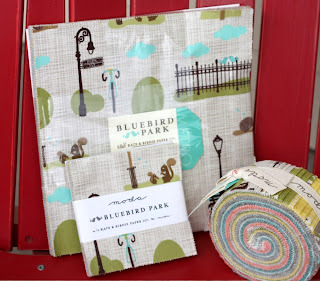 Love the Bluebird Park fabric! I hated camping in a tent, we had a caravan to go away in. Mch more comfy! 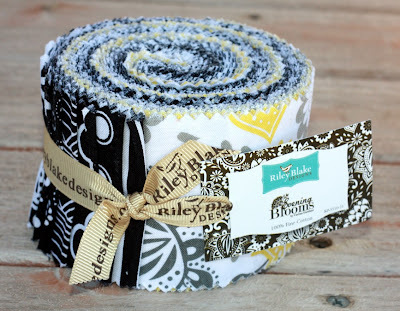 I love the bblebird Park fabric! We still have not gone camping as a family since we've been in Connecticut. Boys have gone to Scout camp; girls have gone to Girls' Camp. No family camping as yet. Must remedy this. 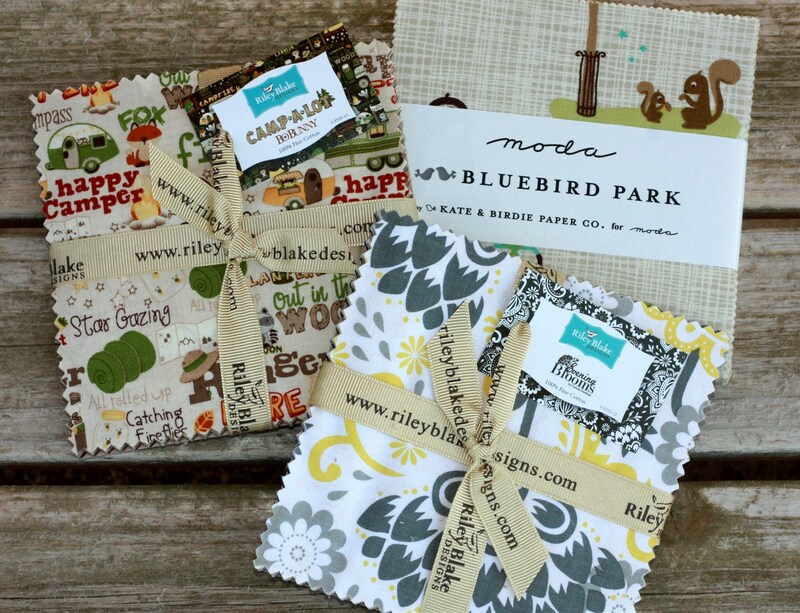 I think I would choose the Bluebird Park fabric, although I keep going back and forth between that and the Evening Blooms. Good choices. Hard choices. We did a lot of camping as a kid. I loved getting up early, early in the morning (and still do) to see the sun come up. Sit by the warm fire, have a cup of cocoa...my Dad always made sure there was a pot of warm water for us to wash with :) Thanks for a great giveaway. My only camping experience was when I was 8 months pregnant, late August many years ago. The heat, the skunks, the dirt, the bugs -- no thanks! My sister loves to camp though, and that camping fabric would be fun to use to make something for her. This summer we went tent camping and the weather was not on our side because it was very cold; however, we kept a fire going on a steady basis and enjoyed each others company!! I used to love camping! I still have my purple and red sleeping bag, only now the dog is using it to sleep on! I went camping in Sturgis, South Dakota for my honeymoon 9 years ago, haven't gone camping since! I'm not a big camper, but it was so beautiful there and we had a blast! 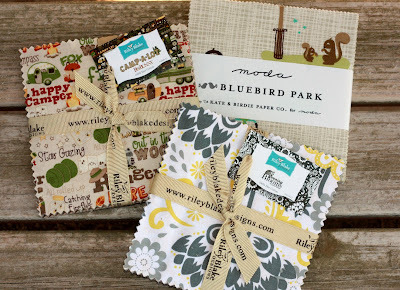 I love "Bluebird Park", the fabrics/colors are so adorable! I grew up camping in Montana. On really cold mornings my parents would serve us the yummiest hot chocolate in our sleeping bags to warm our tummies and get us moving. It's been awhile but my family always camped in the summer when my daughter was younger. We have some wonderful memories with our little pop-up! I'll never forget the time we went to the UP in Michigan (beginning of July) and my husband grabbed the little heater as we were heading out the door. Thank God, because we ran that thing every night. haha!! Just never know! Thanks for the chance! We love camping! Every year, we plan one vacation around camping. What fun! Thanks for the chance! I miss camping. Both my best friend and I married late, so we did a lot of camping together all over our beautiful state. The Minnesota Shop Hop fabric featured some of our state parks, so a wallhanging for her is being planned. Although camp-a-lot is adorable, bluebird park is one I have been wanting since I first saw it! We went camping over Labor Day weekend and I'll be honest-I am not as much of a camper as I thought I was...maybe it is something I am outgrowing, or maybe it is just a stage in my life and I will love it again eventually!?!? I'd love to sew something "camping" for my nephew. He's joined Boy Scouts and his first camping adventure is this weekend. I like the s'mores aspect of camping best. I don't have a camping gene in my body but my middle daughter is all over it. I have no idea where that came from. I prefer glamping to camping! Thanks for the chance! Yeah I hate camping but the kids had a blast when my husband made them a tent in their room over the summer! Best of both worlds! I adore the Blueberry Park! I don't do camping. Love the outdoors but come bedtime, I want my bed. We always went camping when I was a kid. Lots and lots of fond memories of travelling across Canada. Love Bluebird Park. I would love Camp-A-Lot! I love camping (in a trailer not a tent) and I would love to make something using that fabric for my camper! I hate camping, but I do love Evenings Blooms. I went camping once and that was enough for me - too many critters!! I don't do camping. I love electricity, running water and a comfy bed!!! I love camping, but our trailer got messed up by mice, then birds, so haven't been able to use it. I love camping by a lake and sitting out by the fire at night, nothing like it and nothing more relaxing. Bluebird park! It's so cute! I love both the camp-a-lot and bluebird park. Growing up my grandpa took all the grandkids on a weeklong camping trip to the boundary waters in northern Minnesota. One of his rules was that we could only bring what we could carry. My sister and I would load our backpacks full, me with books and her with stuffed animals and pillows. My grandpa would call our tent the "Taj Mahal". My grandpa passed away 5 years ago, I love passing these memories onto my children. I didn't sleep out at camp this year (new baby) but we went up for meals and to sit around the fire with family. As for the fabric, I like the Evening Blooms the best! Thanks for the chance to win!!! We love to camp. We went camping at Inks Lake State Park last June and are planning to go to Garner State Park next summer! We will also take short weekend trips to various state parks to camp. Thank you for a chance to win! Just returned from a camping trip to the Finger Lakes region. The tent leaked a bit, but we were still planning our next trip before we even started home! LOVE camping! I LOVE camping! KOA-type camping, with showers and flush toilets, not primitive camping (shudder). Cooking over a real fire, and the smell of the great outdoors, waking early to a dewy fresh morning... I miss camping SO MUCH. I love the black, gray and yellow - count me in! We love camping, and can't wait to upgrade our camper (the family is getting a little too big for this one)! Our family loves camping. We sold our tent trailer about 3 years ago and really miss it. What super cute fabrics! We have camped with our families for over 40 years and love it - especially the cooking and eating outside, cooking coffee over the campfire and enjoying that smokey smell in your hair and clothing!!! Just camped this past weekend for the last time this year. Our first year camping and we loved every minute. So glad we get to make these memories with our two children. Had pizza pie irons and breakfast burritos over the fire. 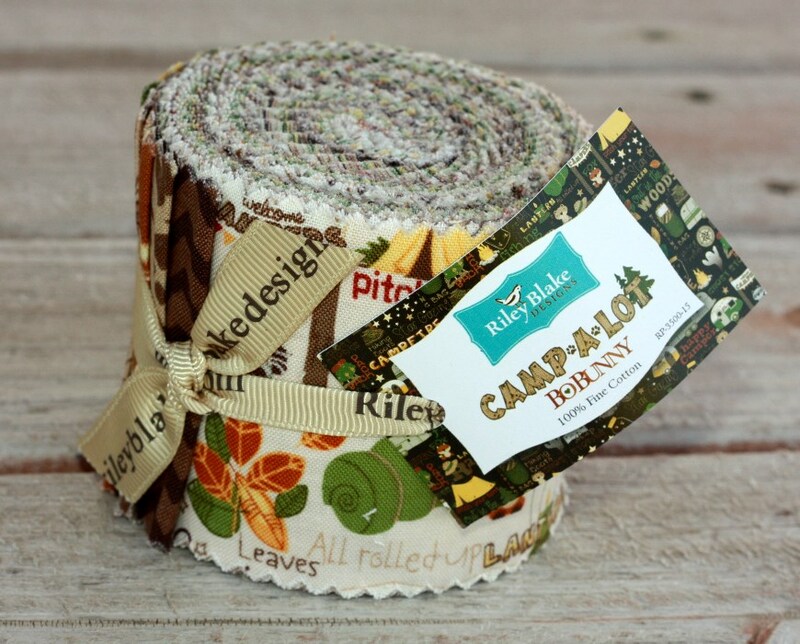 My kids love going camping I would love to make something with the Camp A Lot! We love to camp in our family A LOT! Last weekend we were headed out of town and somewhere between home and campsite and a huge chunk of the fiberglass siding on our camper went flying and is now missing from the side of our camper. Alas our camping that weekend and sadly the rest of the year is over .... The fabrics are adorable especially camp a lot which would make a perfect blanket for my hopefully soon to be fixed camper! I was one of 6 kids growing up, so the only vacation my parents could afford was camping. Luckily, they always chose a campground with bathrooms......I go nowhere without a hairdryer! When I was younger we were camping in Northern California and when we woke up a bear had eaten all of my mom's makeup! My husband and I went camping with a group in college. It was alot of fun, but now with a baby it is a little more complicated to get out of town. Thanks for the giveaway! 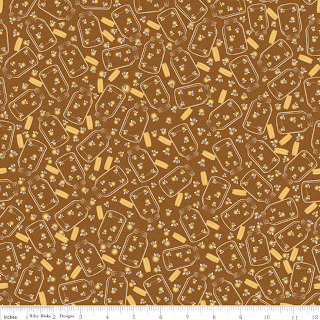 Love the camping fabric, but that is about as close as I ever plan to get to the actual thing. Camping does not appeal to me at all. I went camping (in a camper) for four months last year. Covered 12,000 miles across America...from Colorado to Niagara Falls, and back to FLorida where we live. It was wonderful. My husband drove most of it, and my three boys LOVED it. We use to go camping three times a year when I was younger for an entire week.. we had one of those huge three room canvas tents and my mom use to bring out entire house... no lie. She would set it up living room, kitchen and bedroom area..couch, carpet, and bed all included. It was still a lot of fun, something I hope to start doing with my own children now..minus all the furniture. My first camping trip was on our honeymoon in Colorado Springs, not far from Pike's Peak. We were married in July in the south and it was very hot the whole month. We thought Colorado would be nice and cool. We had a tent and a couple of light blankets and by morning we were freezing! The next day we bought more blankets and tried again. Still too cold, so we got a cheap motel room for our last night. I haven't seen Bluebird Park yet - it's wonderful. I tag along when my daughters go camping with the Girl Scouts --- truth be told, it's not my thing (I like to come in at night) -- but they love it. We did a couple camping trips with our kids this year - love how independent they're becoming, it's getting easier! We used to camp a lot when our kids were younger, but it's been years! And it never was my favorite thing to do, but lately I have been thinking we need to go camping again. I think it would be fun with our grandchildren! Loving all your giveaway fabrics - but drawn to the evening bloom collection. As for camping, a thing of my past (waaaaay past), fond memories from childhood but much prefer a soft bed, a good view and room service. I love them all but I think if I should win I would choose the evening bloom-I have not gone camping since my childhood-and I am in my mid 60s now. It's a toss up between evening bloom and camp-a-lot. I went camping once and that was in a large RV with a shower and bathroom. Don't make me choose - I love them all but Bluebird Park makes me smile! Camping is so relaxing with being one with nature, sitting around a camp fire, hanging out with friends and family. I really like every aspect of it and I am sad when bad weather sets in and the camping goes into hibernation! I camped when I was younger. Now I prefer a bed and bath. Loved Bluebird Park. Thanks for the giveaway! I grew up camping in a California Styleline - turquoise and white. We went camping every weekend! I became an adult and went camping to the Oregon Coast every weekend until I got a job that I work weekends and farm during the week...so only a couple of trips a year...boo! 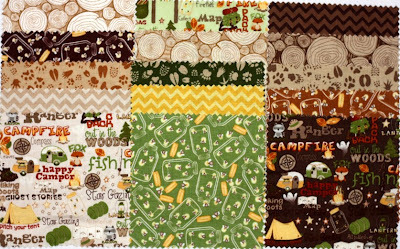 I love the camping fabric! My dream is to find my perfect "glamper" and hit the road again! We spent a week camping and hiking Yosemite with our 4 and 6 year olds - and my parents who only started camping last year! It was such fun to have three generations toasting s'mores, swimming in the Merced River and hiding out from thunderstorms in a tent. I'm beyond thrilled to build these memories for our family! I'm addicting to looking at pix of glamping - and am a serious firebug, can't stop poking at any campfire, anytime! We have a great group of friends that we camp with every year. I think we started when my youngest daughter was 6 or 7. She's now a sophomore in college and shares an apt. with one of our fellow campers! Camping makes for wonderful friends. When my kids were younger we went camping with our church group. I had lots of fun on those trips. I want to go GLAMPING..I have been drooling over those little vintage trailers....what a dreamer I am. Maybe some camping fabric will soothe me. Happy September. Love the camping but my favorite is the squirrels!! I love it! 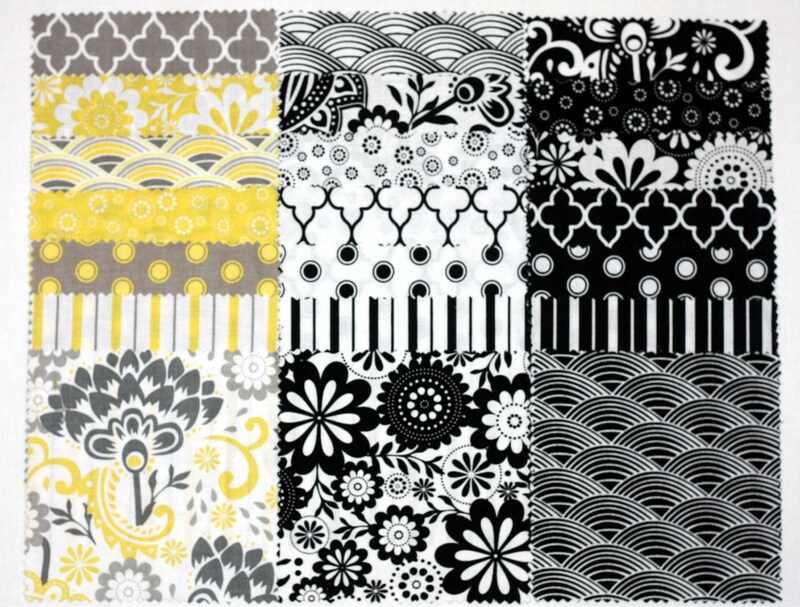 I really love that yellow , black & gray fabric Evening Bloom ? I like the Bluebird Park! I'm not much of a camper. Maybe an overnight or at max a 2 night stay, but after that I get crabby if I don't have showers. Bluebird Park is so CUTE. 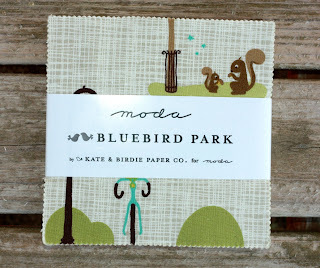 The Bluebird Park fabric is adorable! Although I can't go every year, I love to visit Yosemite in summer, as part of a family tradition. We are going on a two night camping trip today - our first this year. The only scary part - the low tonight is in the 40s! Went camping a lot when freshly married but never really cared for it, too much work. Hotels all the way for me now! I keep thinking, I would like one of those teardrop campers. I think about glamping, and how romantic it looks, fireside, home decor.....but today, I swallowed a bug while outside. "She swallowed a fly, perhaps she will die!" I don't think I will die, but it I think of it "wiggling and jiggling inside"! Bugs, ick. I'm not a huge fan of camping but I do it now and then because my husband loves it. Camping is fun, every once in a while. Only if there is a real bathroom. I love camping! We still see who can get the longest stick and still make a successful flame grilled marshmellow! My favorite is bluebird park and then camp-a-lot. Some of my best childhood memories are of my family camping. We even camped our way through Europe when Dad was stationed in Germany. Love the Evening Blooms! We love camping! We did about 3 weeks this summer. Rain or shine it all fun. I'm not much of a camper, but do love the outdoors. 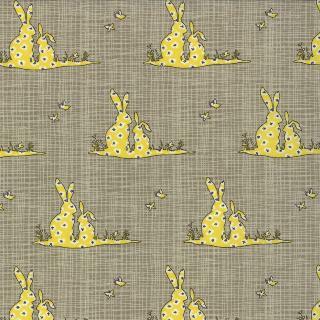 I'm not much of a fan of camping-I prefer air conditioning and a lack of bugs- but I absolutely love the camping fabric by Bo Bunny! Thanks for a chance to win a great charm pack! I did camping only once, when I went on safari in Africa. A camping holiday at the seaside is nothing for me, I definitely prepare hotels where I get dinner served at a nicely decorated table. Thanks for this chance! Love the little hedgehogs. All the fabric is adorable. As far as camping goes....best part is a campfire and the beautiful the night sky. Thanks for the give away chance. We went camping every summer for years in the Black Hills. If you've never been there, they are covered with pine trees. The breeze is scented with pine; it's cooler in the Hills every summer. There are dozens of lakes filled with rainbow trout for the fishing enthusiast (which would be my husband). If you listen quietly to the breeze blowing through the pine needles, it begins to sound like a gentle voice whispering to you, saying something you can allmost, but not quite understand. You listen a little harder, almost expecting to hear words. You can easily see why the Hill are sacred to the Native American tribes. oh oh oh Bluebird Park, those bunnies are to die for. I'm in love with the fireflys to though, we have those in our backyard! Camping..well I've never been, would love to though. So cute! We were a little scared to go camping this year, what with 18 month old twins. But we have GOT to go next year! 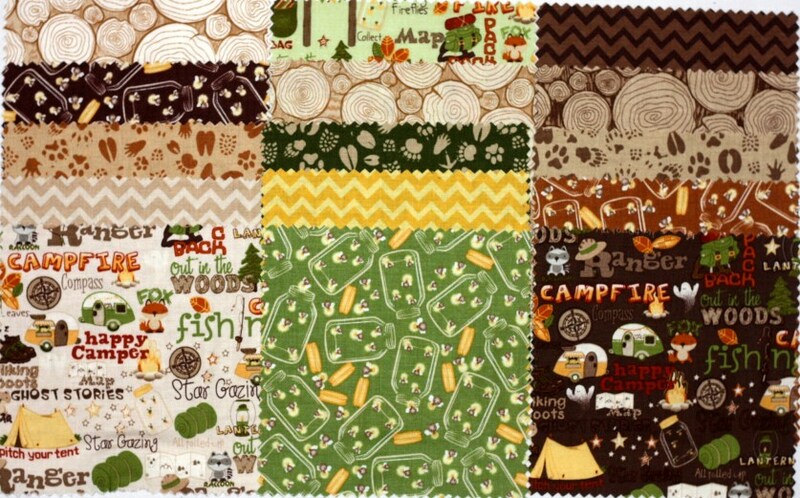 I love the camping fabric. 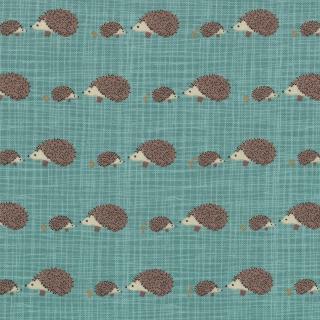 I love the Bluebird Park fabric with the cute hedgehog fabric. I have only ever camped once in my life and when we unpacked I realised my husband had left my bag of make up and toiletries sitting on the kitchen table. He kindly went back for them. Tank you for a fun giveaway. I love the bluebird park, though the fireflies remind me of the first time I went on a camping holiday by bike, touring the South of England. There were loads of fireflies that summer, it was the first time I saw them. I love camping. After my husband and I first got married we went on a big fourth of july camping trip with my parents, it was so much fun! Best part is the s'mores around the campfire. 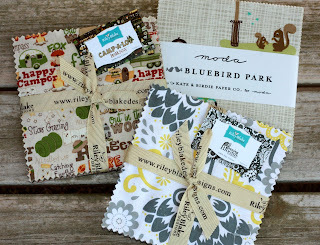 I love all the fabrics you are so kind to giveaway, but the bluebird park is probably my favorite. I haven't camped in years, since my son was small...but it would be fun to try again with a warm cuddly quilt to wrap up in! 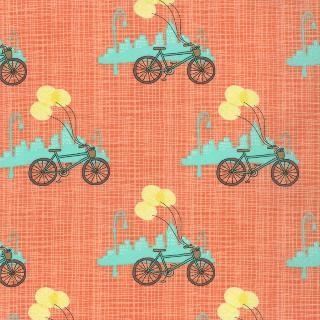 These fabrics are so cute! Thank you for a chance to win! I went camping about a year ago with my best friend in Glacier National Park. It was so much fun! I love wildlife and we definitely spotted all kinds of creatures. Bluebird Park is so cute!!! I love the bike and balloon print. Thanks for the chance! My husband states it best. His idea of camping is "staying at Motel 6." Have a great weekend! I adore camping! We have this awesome site nearby but we weren't able to go this year because I was VERY big pregnant and now we have a one month old. I love this fabric and can't wait to play with some! I went to girls camp this year with church. I was a cabin mom over first year girls (12 year old girls). We had great weather until the last night when we had a 45 min down poor. Got to love western Washington. It was a blast. I cant wait till next year. I would like the camping please. We're yurt campers for the most part. Cheap and a bit more upscale way to see some great parks. Oregon state parks have a ton of them and we always stay at them near a beach. You stay dry, it's heated at night, you sleep on a bed, showers are nearby. Can't beat it! The best thing about camping in the summer is listening to the crickets at night time. Tip for autumn camping: try to be the one sleeping in the middle. I nearly froze a leg camping once near Versailles in France! It was brilliant anyway! HELLO,One camping trip on the sand dunes near Lake Michigan was really a fun time>swimming,cooking on the beach>neat! Thanks for sharing! My parents would take us camping every weekend in the summer. We don't do any camping anymore but still love cooking on a fire pit. We used to camp a lot when we were younger. My husband and I loved to tent camp and since our Anniversay is always Memorial day weekend we would always open up the summer with a camping trip. Loved it . Thanks for sharing. I miss camping. It's been a long time. Thanks for the giveaway. Evening Blooms is my choice, but I like them all. We have lots of fun camping stories. Once we were in a camper with friends and one guy kept complaining about how cold he was all night and we kept telling him to 'man up'. When we got up in the morning, his sleeping bag was frozen to the side of the camper! I love that camping fabric! My only comment about camping is it's better when you're young and I'm sorry, but I really need a real bathroom. So, the best option is camp during the day and the husband and I stay at a lodge while the kids and grandkids can tent it. Oh my gosh, they couldn't get any cuter!! They're all so adorable, but I think the hedgehogs & squirrels have run away with my heart! I've been camping all my life with family, so I was really excited on my very first, grown-up trip with friends. We set out on a beautiful sunny day, headed toward the mountains (Blue Ridge, in VA). We set up camp just as the sun was going down....dinner & s'mores were had & we all watched the stars for a bit, then tucked into our sleeping bags for the night. It got colder & colder, and we all put on more & more layers of clothes. When dawn finally broke, our site was covered in snow & water that had been left in a pot overnight was solid ice. It didn't take us long to break camp & head home to get warm. Fast forward a couple years...same friends, decided we'd head down to the beach for a weekend of fun & sun at the Outer Banks (NC). Tent was pitched and camp was made....and then in blew a hurricane! We scrambled to pack everything up (yes, wet) and head out as quickly as we could. Not too long after we went over the (only) bridge out, they closed it due to high winds. Good thing, too, 'cuz if we'd stayed, we surely would have been blown away! I still love camping, tho, but now we go in our 40 foot 5th wheel, and I get to take my sewing machine & lots of fabric with me! Being from Arkansas we used to float and camp the Buffalo river a lot! I haven't been camping in Forever, cant wait to take my 4 and 3 year old sons; but will probably wait until next year. Love the Camp-a-lot set! Ashlee @CreatedbyMammy on etsy. We are waiting for the weather here in Texas to cool down a little then we'll be heading out camping. Camping in a tent in the middle of the Texas summer heat is a big no go in our book, yikes! I love all three collections.When my children were younger, we occasionally camped and enjoyed it. One time we planned our trip for weeks and had it all together for the big day. We loaded up and headed out early. Once we got to our site and pulled in, a huge storm came and we spent most of the day sitting in the truck waiting for the rain to subside. Finally, we gave up and went home.We never went camping again. I have never really been camping but we do camp in the backyard - my six year old and myself. It is very cute!! We have always enjoyed camping, and in the 70's we met my in-laws in Colorado and enjoyed spending time with them. We lived in IL and they lived in CA, so it was a good way for our children to see their grandparents. We just loved camping and hiking. Later we made several trips to CA to see them, and camping was the only way we could afford the trip. We have since sold our pop-up tent camper, but we have discovered that many KOA campgrounds have very nice cabins. It allows us to again enjoy wonderful places in our country and cost about half that of a motel. Two years ago we drove our 14 and 16 yr old granddaughters from IL to CA and had a wonderful time introducing them to some of our favorite places. The KOA cabins worked very well for the 4 of us! Sorry, camping isn't for me. I much prefer a cabin in The Smokies (where I am now) to a tent. Love Evening Blooms! Love camping, DH not so much we had different life experiences growing up camping, hence the strong emotions about it. The Grandson's love camping in the tent out back on our farm though. I did a "Becoming an Outdoors Woman" (BOW) this August. Love the outdoors. I would love bluebird park! Evening Blooms is my favorite. They are all lovely, but I think Bluebird Park is my favorite. We spent most of the summer camping with my mother's side of the family when I was a kid. It was a hike-it-in camp ground back then and we learned early to pack efficiently! The extended family started to drift apart after my grandparents passed, so 3 years ago we all decided to start a new tradition of spending the first week of August at said campground (now a drive-in, thank heavens!) for a come-when-you-can family reunion. My mom is one of ten siblings, so as you can imagine, when all of the cousins and their children come, we are quite the crowd! Bluebird Park is my favorite those hedgehogs are adorable. I love to camp, but one time my husband and I drove to a lake to go camping, and the lake was dried up. Then, we felt like someone was lurking outside our tent, so we packed up in the middle of the night- hiked the 2 miles out- and drove home! I love camping...the smell of the fire, camp food, fishing, hikes, laziness...breakfast around the fire. Thanks for the giveway. Now that I am disabled camping means sleeping in a yurt. But I do love being out of doors. My family really enjoys camping even when it's just in the backyard. Although I admit I would really rather go in some sort of camper because I don't care for tent camping. My husband is my sons Boy Scout leader so we have a lot of outdoor activities in our life. 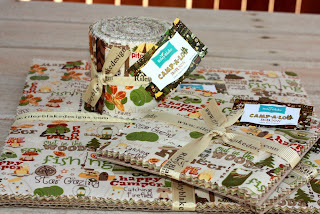 Anyhow the fabrics are beautiful and thanks for the chance to win! We went camping at Tahoe this summer - before it got warm. You know you're roughing it she n your toes are numb in the morning! Used to enjoy camping... Now I enjoy a great motel. Not much of a camper. When I was in Girl Scouts we took a boat over to Catalina and learned how to check into a hotel. I'm sure it was a badge. 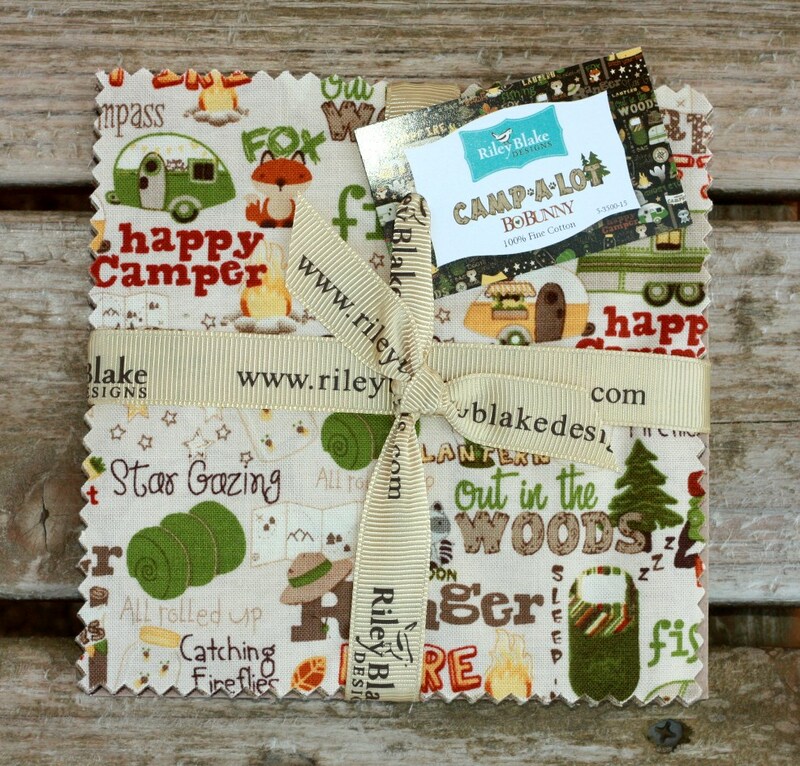 Love the camping fabric! I took an amazing 31 day camping trip this summer from home in NC up to Jasper down to Banff and Glacier and Yellowstone . I love hiking more than camping but my family are camping freaks so away we go! 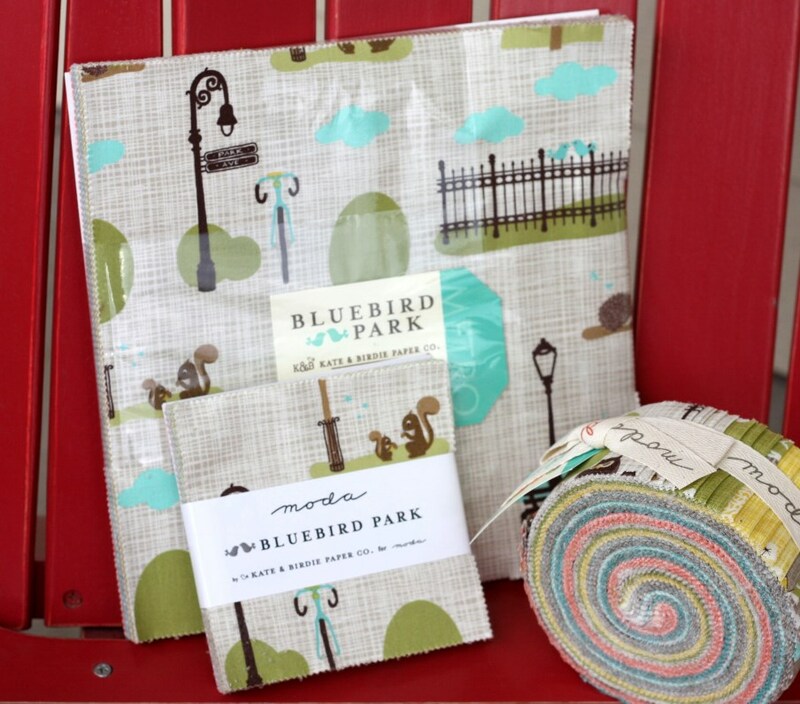 I would love to take some cute fabric nextime - like Bluebird park! Thanks! When I was a teenager my Dad owned a campground, so we were camping all the time! Although there was more work involved than fun. We have a pop-up tent camper. It's more work to set up but it has the outdoor tent feel with comfortable beds.